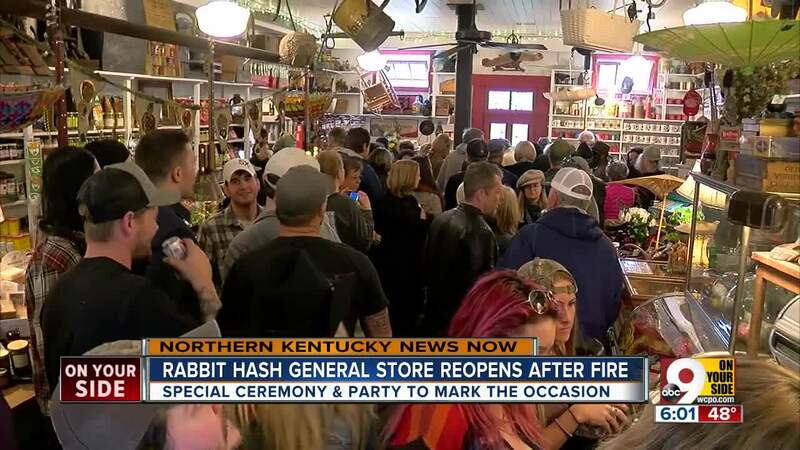 RABBIT HASH, Ky. – After the iconic Rabbit Hash General Store nearly burned to the ground last year, its caretakers set out to rebuild the 185-year-old landmark with the same look and feel. After literally rising from the ashes, the store reopened Saturday afternoon with special ceremonies to mark the occasion. 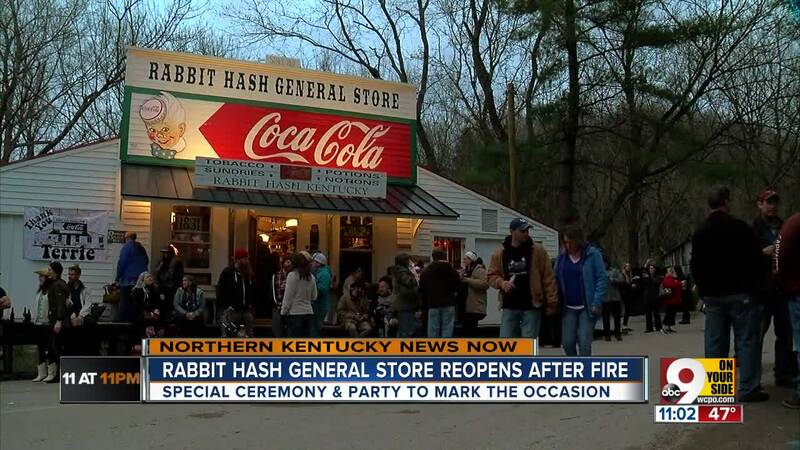 Mary Unterreiner, president of Rabbit Hash Historical Society, said seeing the store open again was “inexplicable." The store has been both modernized with smoke detectors, a sprinkler system and a walk-in refrigerator and preserved with the old stove and materials salvaged from the fire and five other nearby buildings of its era. Judy Raker saw the store go up in flames over a year ago, and she said she was impressed with the turnaround. "We actually drove through the day it burned down, and I'll tell you they did a great job,” Raker said. “It's awesome -- so a lot of good people good food. It's great." Perhaps no one was as excited to see Rabbit Hash’s beloved general store than Annie Woods. Woods has been going to the store since she was a little girl. "It’s one of the few places left where you can come down, sit down, spend some time, talk to people,” Woods said. Don Clare with Rabbit Hash Historical Society said the reopening felt like being at home. "You can see it on the smiles on everyone's faces. It's just great to have the store back,” Clare said. After watching in heartbreak as flames consumed the original building, residents vowed the next day to rebuild it with authentic materials in order to maintain its treasured spot on the National Register of Historic Places. 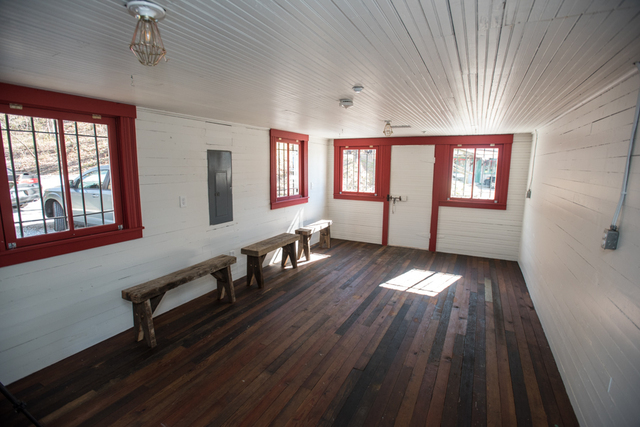 "We salvaged studding, siding, shelving, flooring, the porch overhang, rear door, front center door, window frames, and more," Duane Doyle, vice president of the Rabbit Hash Historical Society, told WCPO. Era pieces were donated or brought in to replace the artifacts consumed in the fire. PHOTO GALLERY: See more of the renovations. The re-opening celebration began with a ribbon cutting ceremony at 9:30 a.m. The store featured live music, including performances by Cadillac Catfish and the Rhythm Gang, The Modified and The Star Devils. Boone County Judge Executive Gary Moore has proclaimed April 1 through 8 as Rabbit Hash General Store Week.